Sushi Den is a unique, modern Japanese restaurant where the feast is as much for the eyes as for the palate. 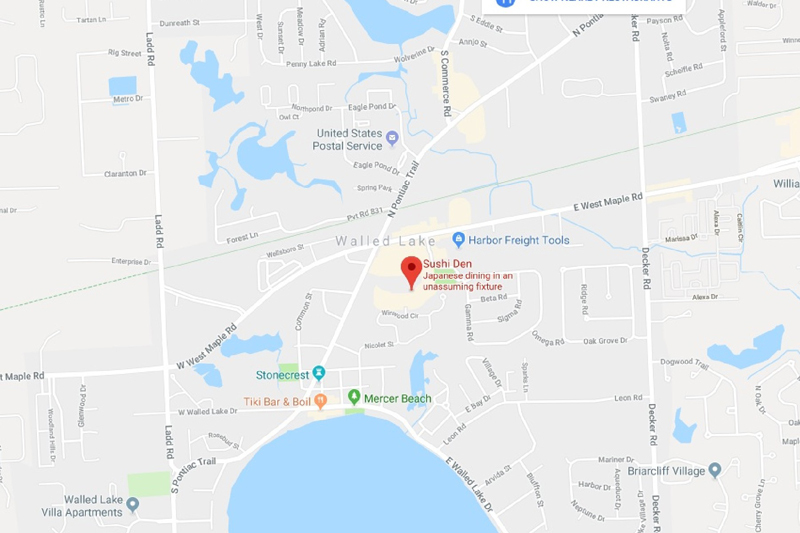 New to Walled Lake Sushi Den is sure to be quickly noted for delicious food and to be one of Walled Lakes’ finest Japanese restaurants. Simply and tastefully decorated in light woods and accented with attractive Japanese wall-hangings, this immaculate and intimate restaurant with its hospitable staff provides an inviting atmosphere for the memorable dining that follows. Sushi Chef George Shokinji presides over the extensive sushi bar, all of his artistic culinary creations look as pristine, fresh and delectable as they taste. Sushi Den offers a wide selection of superbly prepared cooked entrees such as Tempura, Teriyaki and a variety of Katsu. In addition to the tasty appetizers and entrees, Sushi Den offers a full range of rice and noodle entrees. Sushi Den is sure to become your favorite area sushi bar.